The new dashboard, designed to increase sales for HubShout resellers, further advances HubShout’s solid reputation in the SEO reseller market. This (HubShout) dashboard is the ‘missing link’ to me getting into the SEO biz for my clients - the accountability and transparency are what my clientele need to make an informed decision about investing in search engine marketing. HubShout, LLC, a U.S.-based search engine marketing firm, recently refined its SEO reseller portal, setting HubShout further apart from its competitors. The new dashboard, designed, developed and built by HubShout programmers, is available exclusively to agencies that join HubShout’s SEO reseller program. What began as a search engine marketing and pay-per-click advertising service for direct clients quickly evolved into HubShout's SEO reseller program. HubShout recognized that businesses interested in SEO outsourcing were looking for an efficient, automated, yet uncomplicated reporting system that would allow them to effectively manage their current clients’ campaigns and could be easily demonstrated to potential clients. HubShout's reporting software proved to be the ideal solution. The original version of the reporting dashboard, developed by HubShout co-founders Adam Stetzer and Chad Hill in 2009, has served clients well. But the new dashboard offers so much more. The new interactive and transparent reporting dashboard is unlike anything on the market for SEO outsourcing. Enhanced functions include animated graphs that show detailed data when the user clicks on various regions of the graph. Clients can now drill down through more layers of data and do more with it, significantly improving the ability to connect SEO ranking and PPC campaigns to business and revenue growth. The beautiful new graphics package provides a much needed “face-lift” to the dashboard--certainly helpful for making a great first impression on reseller’s potential clients. 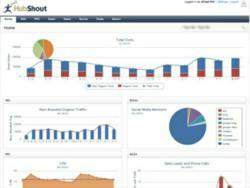 The dashboard is integrated with Google Analytics and automatically collects and reports data. The SEO module shows organic visits (branded and non-branded), backlinks that have been created, domain authority, Google rank for targeted keywords, workflow for the campaign, articles that have been written and links to sites where content has been published. Clients with PPC campaigns are able to view month-to-date clicks, conversions, cost per conversion and total spend per keyword in the PPC module. Goals and projected results are displayed on the dashboard so that clients can see that the campaign is meeting all objectives. The system generates a monthly report, branded with the reseller’s logo, and emails the report to clients. Other modules on the dashboard include Sales, Social and Email. The sales module generates a daily report of phone and web leads. The social module reports all comments and reviews that have been written about a client’s business so they are aware of what’s being said about them on the web and can take action if they so choose. Resellers can use the email function to create and send automated alerts and other communications to their clients. On the new HubShout dashboard, all of these features provide more data and are easier to use. Privacy and confidentiality are a common concern for SEO resellers. HubShout’s white label SEO reseller dashboard and all communications auto-emailed from HubShout are branded with the reseller’s logo. HubShout’s resellers are pleased that their brand is more prominent on the new dashboard -- the space for the reseller’s logo is now 60% larger. Firms that outsource SEO place high value on HubShout’s workflow transparency and white label SEO capabilities. Resellers that outsourced SEO to other firms prior to joining HubShout report far greater sales with less effort due entirely to HubShout’s software. Agencies that resell SEO through HubShout have a considerable advantage over their competitors in that campaign workflow, data and results are transparent and readily available to clients 24/7 on the HubShout dashboard. As one top HubShout reseller affirms, "This (HubShout) dashboard is the ‘missing link’ to me getting into the SEO biz for my clients - the accountability and transparency are what my clientele need to make an informed decision about investing in search engine marketing." HubShout, LLC, is a search engine marketing firm with white label SEO and PPC capabilities that provides comprehensive, transparent and accountable SEO and PPC reporting. Technology based software and services are the core of HubShout’s success. Dr. Adam Stetzer, president, and Chad Hill, CEO, co-founded Hubshout in 2008. For more information visit hubshout.com.